See all Calcaneal fracture CPT codes. Calcaneous fractures with >3mm of articular displacement in young, active patients. 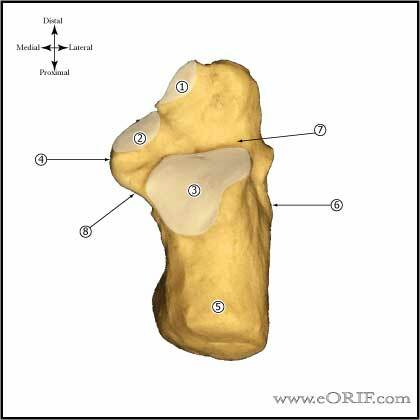 Bross widening of the heel with lateral dislocation of the tuberosity. Flattening of the talar axis. 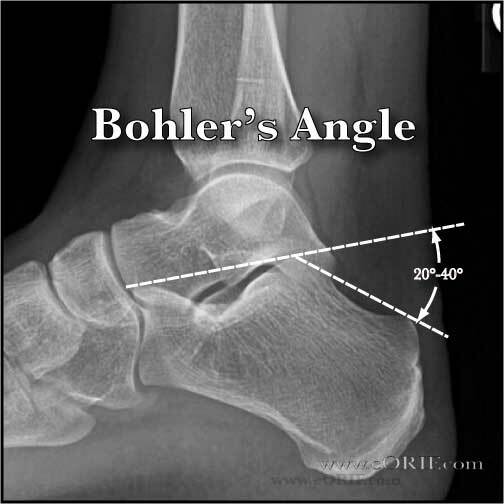 Minimally displaced fx: Bohler's angle >0°, posterior facet step off <2mm, entire facet depressed as unit forming a secondary congruence with the talus. Extensive soft tissue injuryprecluding surgery within the first 6 weeks. Severely comminuted fractures precluding ORIF: consider primar subtalar fusion. Patients who will not follow post-operative instructions: elevation, NWB. Ilizarov (Emara KM, CORR 2005;439:215). Wait for fracture blisters and edema to resolve before surgery; usually delay surgery 7-14 days. Open fractures generally treated with I&D within 8hours with fracture fragment repositioning to alleviated skin tension with delayed fixation when soft tissues permit. 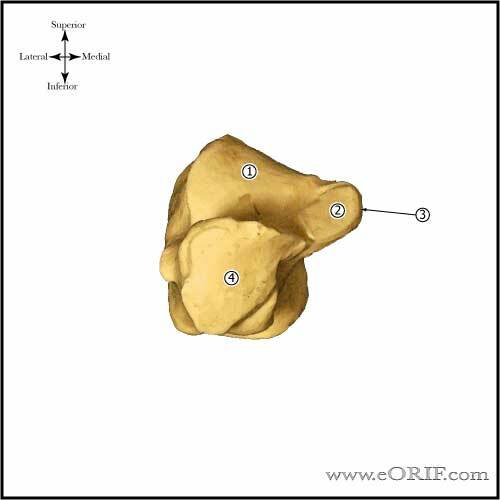 Consider bone graft sites depending on fracture configuration: iliac crest, proximal tibia, allograft, substitutes. Supine position on radiolucent table with heels jost off the end of the table. All bony prominences well padded. Oblique medial incision posterior to the NV bundle. Lateral incision just anterior to the tip of the of the lateral malleolus, extending 5-6cm towards the heel, parallel to the sole of the foot. Risks: Sural nerve. Expose fracture both medially and laterally. Remove all debris. Place 2mm K-wire into posterior-inferior tuberosity, tension with a Kirshner bow and use for traction / ligomentotaxis reduction. Reduction with temporary k-wire fixation procedes as follows: 1-anterior process; 2-Medial wall and medial posterior facet; 3-tuberosity; 4-posterior facet. Ensure subchondral screws across posterior facet are proper length. Long screws will be in FHL groove and irritate FHL tendon. Reduce medial wall with and varify with fluro. Fixation provided with low-profile plate with a minimum of: 2 screws in the anterior process, 2 in the subchonrdal posterior facet and 2 in the posterior tuberosity. Consider medial wall fixation with 2.7mm plate or axially directed screws. Consider augmentation with calcium phosphate cement. Fixation must be strong enough to allow early motion. Repair ankle ligaments if concomittant injury has occured. Usually with anchors. Repair peroneal tendon sheath if concomittant injury has occured. Infection, Wound helaing problems, Pain/swelling, Malunion, Nonunion, Subtalar arthritis, Sural nerve palsy, Tibial nerve palsy, Tendon entrapement / rupture (FHL), functional limitations. Bulky jones dressing with posterior splint post-operative. Must keep foot elevated for first 36-72 hours to decrease incidence of wound healing problems. 7-10 day f/u:calcaneous xrays, SLC, NWB. Consider cam-walker with gentle ROM exercises. 4 wk follow-up: calcaneous xrays, compression stocking, cam-walker boot, gentle ankle/subtalar ROM exercises, NWB. Sub-talar motion = figure-of-eight motion, drawing alphabet with the great toe. 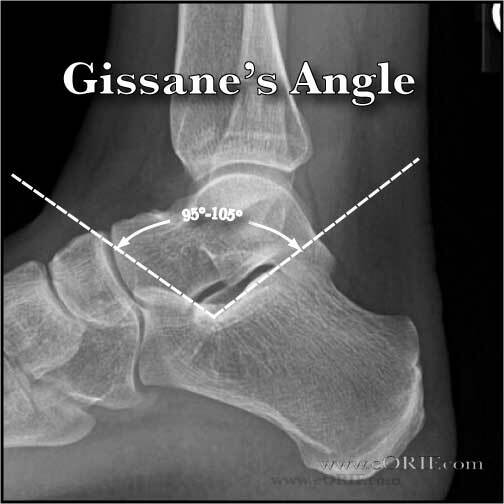 3 months f/u: calcaneous xrays, 25% WB, progress to full WB over 1-2 weeks. Start PT for ROM, gait training. 6 months f/u: calcaneous xrays, evaluate function outcome, ROM. 1 year f/u: calcaneous xrays, evaluate function outcome, ROM. Long terms patients often are unable to run, and have difficulty walking on uneven surfaces. Generally able to walk on flat surfaces, golf, swim, bike and do ADL's without difficulty. Poor outcomes associated with smoking, IDDM, multiple medical comorbidities, non-compliance, workers compensation. Heavy laborers / construction workers generally require job retraining. Mean AOFAS score = 65.4 at a mean of 12.8years of follow-up. (Potter MQ, JBJS 2009;91A:1854). Sangeorzan BJ, in Masters Techniques in Orthopaedic Surgery: The Foot and Ankle, 2002.